Delve into Kalapuya food culture with University of Oregon archaeologist and MNCH Curator of Zooarchaeology Madonna L. Moss. 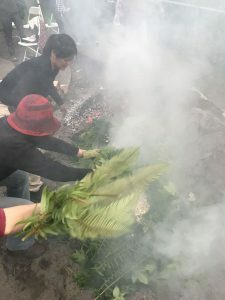 As part of her new UO course, The Archaeology of Wild Foods and Pre-Neolithic Cooking, Professor Moss and graduate students harvested and dug camas at the Oregon Country Fairgrounds in June 2017. Under the supervision of Marie Knight (Warm Springs) they baked the camas in an earth oven overnight at the UO Many Nations Longhouse. Come learn about the process of harvesting and baking this traditional food that was once abundant in the Willamette Valley. Free to the public. Cosponsored by Eugene Public Library as part of the 2018 National Endowment for the Arts Big Read program.